If you're reading the label on your favorite sports drink, you may find sucrose acetate isobutyrate among the list of ingredients. The chemical name might raise red flags in your mind, but sucrose acetate isobutyrate is safe, and it plays an important role in maintaining the drink's flavor. Sucrose acetate isobutyrate is a clear liquid food additive that works as an emulsifier, which means it helps mix water and fat. More specifically, the food additive helps distribute and suspend the flavor oils in a drink. It's made by combining sucrose, which is sugar, with the chemicals acetic anhydride and isobutyric anhydride. Sucrose acetate isobutyrate is odorless but has a bitter aftertaste if used in high amounts. In certain sports drinks, sucrose acetate isobutyrate replaced brominated vegetable oil, which is a food additive linked to memory loss, skin lesions and nerve disorders, according to a 2011 article published in Scientific American. Sucrose acetate isobutyrate is also used in energy drinks and electrolyte-replacement beverages. You might find the liquid emulsifier in various alcoholic beverages as well, including wine coolers, malt beverages and bottled mixed drinks. Sucrose acetate isobutyrate has undergone both animal and human studies to test for safety and toxicities. While research has found that dogs have a difficult time metabolizing the food additive, the same has not been seen in the human studies. The U.S. Food and Drug Administration considers the food additive safe but has limited the allowable amount to 300 parts per million in alcoholic beverages, according to the Center for Science in the Public Interest. While you may not have to worry about any direct ill effects from sucrose acetate isobutyrate, the drinks that contain the food additive may be a source of calories you don't need. 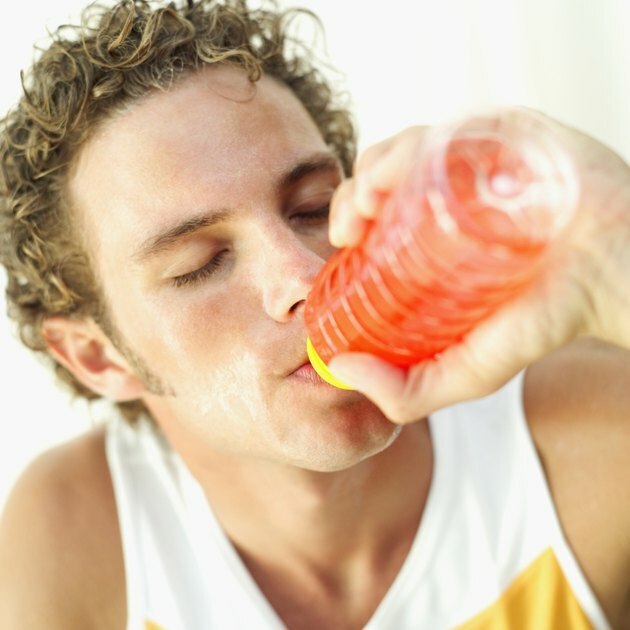 Sports drinks, for example, should be limited to endurance athletes to replace carbs, fluids and electrolytes after prolonged exercise. Also, energy drinks can be a source of sugar, and while some may be touted as aids for weight loss, they may actually lead to weight gain, according to a 2013 article published in Today's Dietitian. Does Sweetened Green Tea Burn Fat?